We had one of those busy, busy weekends with both days packed full of fun and adventure. Sometimes after that kind of weekend I am left feeling exhausted and needing a weekend to recover from my weekend. Not this time. After this weekend I feel refreshed, excited, and ready for more adventure in the really cool place where we’ve settled for the week. I guess that’s what the crisp mountain air will do to a person who has spent the last 6 months in the desert. But I am getting ahead of myself. Let’s back up and start with Saturday morning’s adventure. The Museum of Space History. The museum is located on the edge of Alamogordo about 20 minutes from Oliver Lee State Park. Several people recommended that we visit, and since we love a good museum (especially one that only charges $6/person!) we decided to stop on our way out of town. 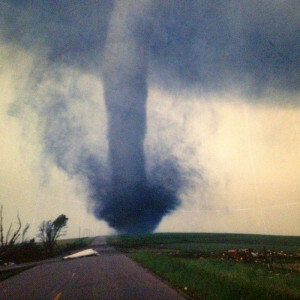 The museum also has an IMAX theater and we arrived just in time to catch the 11:00 showing of Tornado Alley. 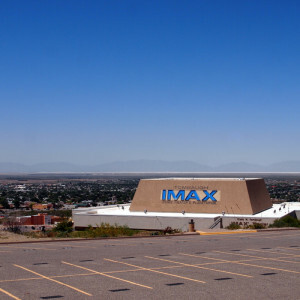 They offer a combo museum/IMAX ticket for only $10, which makes this the best $4 movie I have ever seen. I didn’t take many photos inside the museum, and none that were worth sharing, but we spent an enjoyable hour or so walking through the exhibits. We both agreed that the most fascinating part was learning all about New Mexico’s role in space exploration. 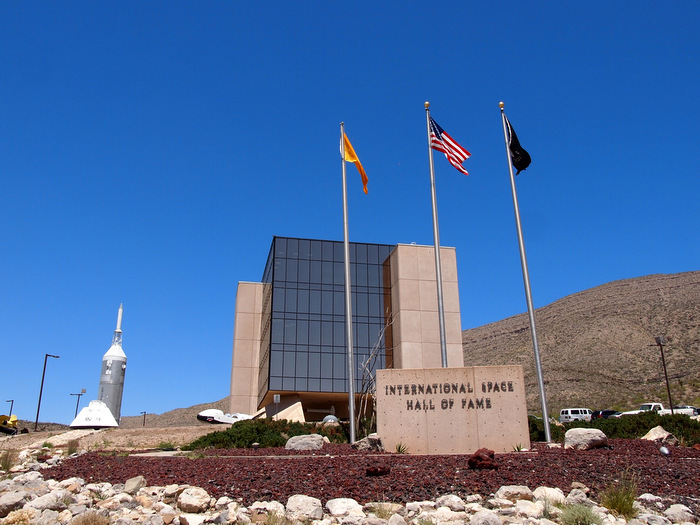 Both in the past when all sorts of missile and rocket testing took place at White Sands Missile Range, and today at Spaceport America where commercial space travel is the way of the future. Which, by the way, we really wanted to visit, but the guided tours are $60/person! I am sure it’s really cool, but is it $120 cool? Outside the museum are a bunch of missiles and rockets on display. Including Little Joe II who was used to test the Apollo launch escape system back in the mid-60s. They also had the Nike Ajax Missile. The world’s first operational air defense guided missile. 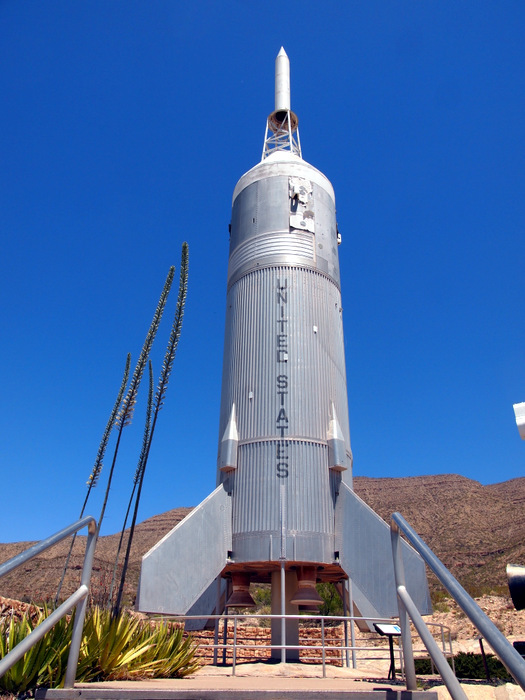 This missile first flew at the White Sands Missile Range in 1951. It had a range of 25 miles. 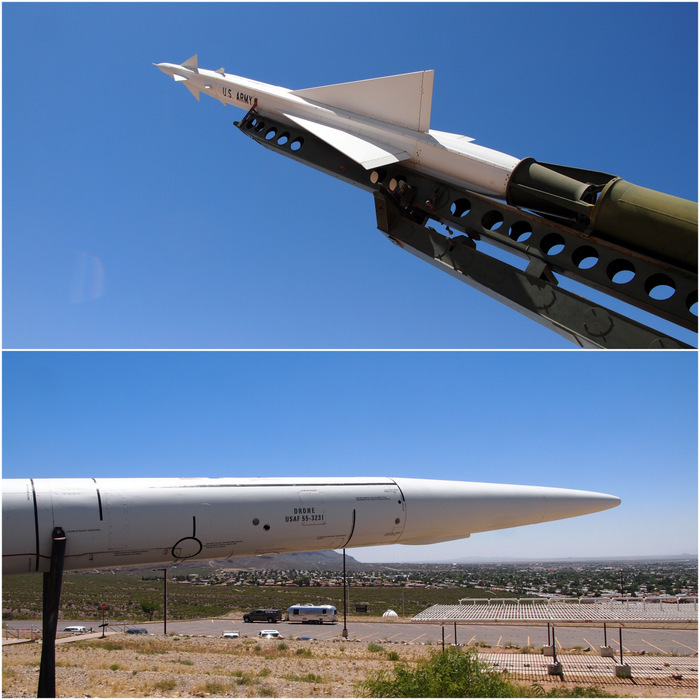 The drone pictured below the missile is 34-foot XQ-4 model A drone which made it’s first free flight at the nearby Holloman Airforce base in 1956. After our museum experience we had a little lunch in the parking lot (another reason to love RV travel) and then headed up to the mountains. And when I say up, I mean up. 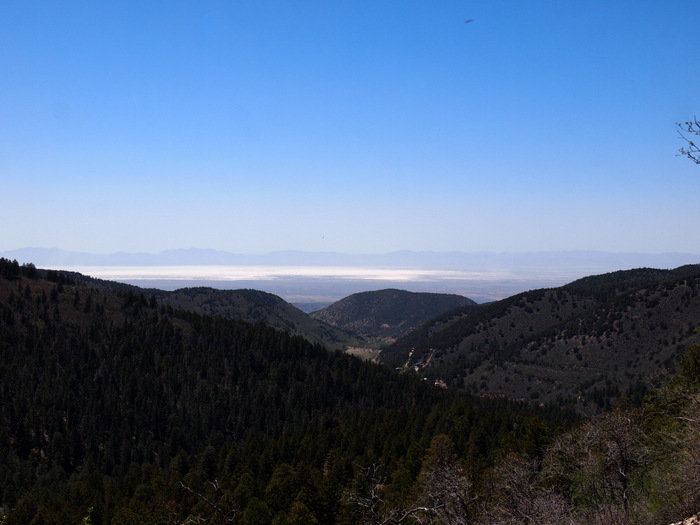 In a mere 15-miles we climbed up 4,000 feet and watched as the landscape changed from flat, scrub-brush filled desert to a mountainous forest dense with tall evergreens. It’s amazing what a few thousand feet in elevation change will do. 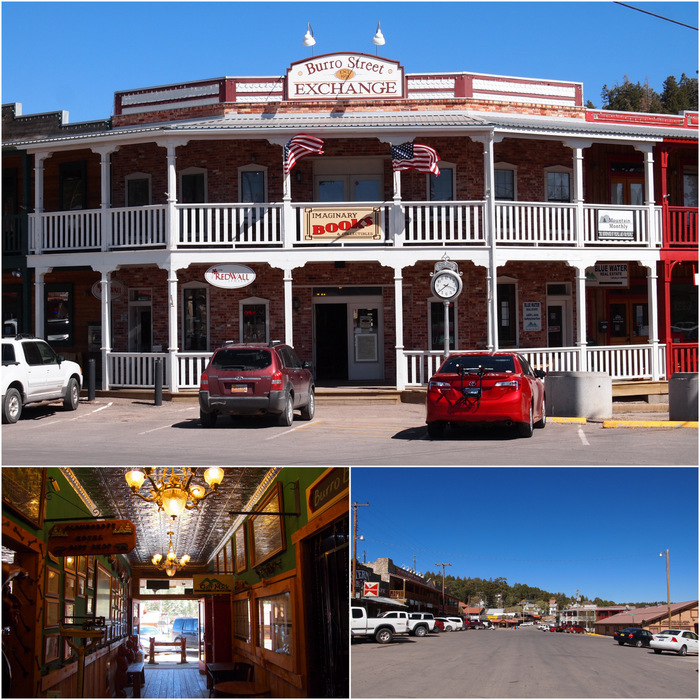 Our destination was the tiny town of Cloudcroft which lies in the Lincoln national forest at an elevation of 8,600-feet. 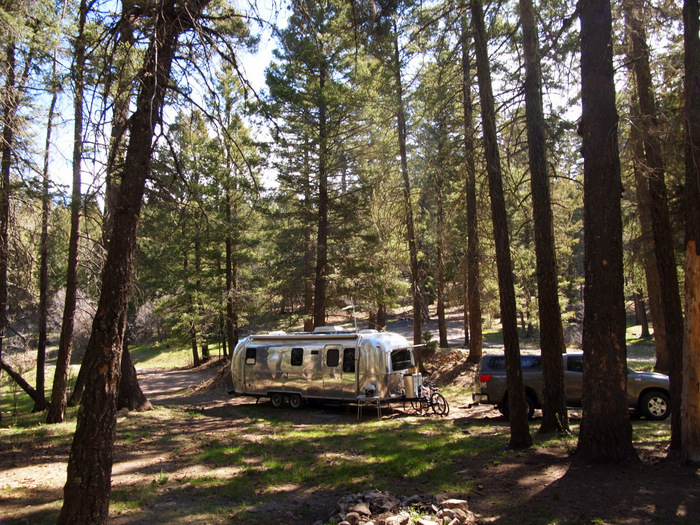 There are a handful of national forest campgrounds nearby, but since none are open for the season yet, we found ourselves a nice boondocking spot in the forest only a few miles outside of town. Even though just last week I was gushing about cactus flowers and the beautiful green desert, the truth is that lately we’ve both been feeling like we’re ready to leave the desert behind and find some mountains and forests. 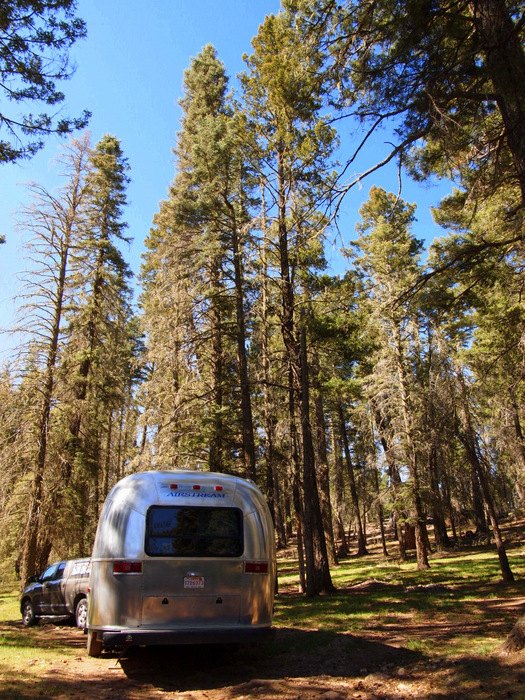 The last time we truly camped with trees around us was last October near June Lake in CA. That was 7 months ago! 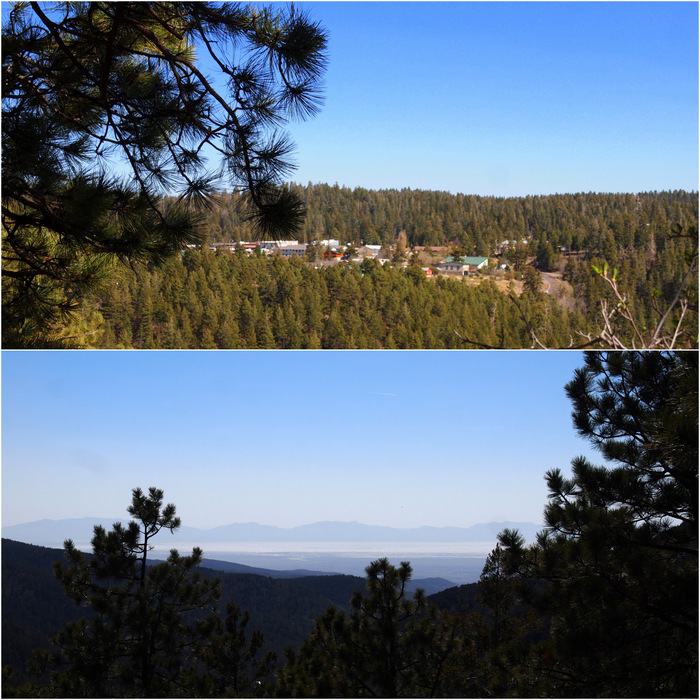 Since it’s still a bit cold to head up into Colorado, and we still have things to see and places to visit in New Mexico, we figured a few days in Cloudcroft would satisfy our forest lust for now. At first we were only going to make this a one night stop over on our way down to Brantley Lake State Park near Carlsbad. But then we saw the weather forecast. Today in Carlsbad it going to be 97-degrees! Here in Cloudcroft? The mid-60s. So then we thought okay, we’ll stay a few days and then head down to Brantley Lake on Tuesday afternoon when the temps go down into the high 80s and low 90s for the rest of the week. 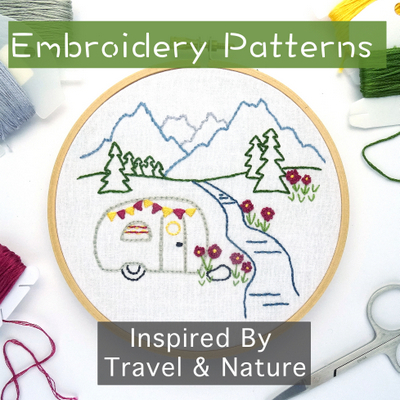 But wait a minute…why do we want to go hang out in the hot blazing sun with no shade when we could be up here surrounded by trees with the scent of fresh evergreens in the air? The answer is that we don’t. Even if we got a site with electric so we could use our AC, who wants to spend all day inside with the AC on? Not us. So now we’ve decided to stay here all week and just head down to Carlsbad for the weekend so we can visit the cave. It’s still going to be hot, but we’ll probably only stay for Friday and Saturday night, and we’re willing to put up with the heat for a few days to visit a really cool cave. After getting settled in our spot the first thing we wanted to do was go for a hike in the woods. As luck would have it there’s a trail that goes right past our site. We didn’t notice it when we first parked. We must have been too dazzled by the trees because we almost parked on top of it. I realized this yesterday morning when a group of mountain bikers whizzed past my bedroom window about a foot away from where my head was. Ooops. Haven’t seen a single person on the trail today though, so I think we’re good. 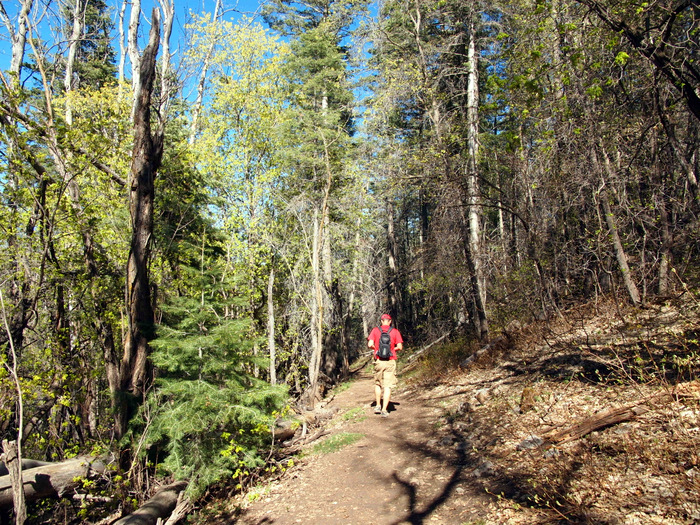 The trail travels over to the Pines National Forest Campground, which is only about a 1/2 mile away through the woods. From there it hooks up with the Osha trail and then splits off in two directions. One goes into town, and the other makes a loop through the woods. We chose the loop and ended up with a nice 4.5 mile afternoon hike through the forest. The whole time we kept talking about the trees and how nice it was to be hiking through a forest, with shade, and plants that don’t prick you every time you touch them. We’re such freaks. You would never know that we just spent the past 10+ years living in a house in the middle of the forest. At one point the trail opened up and we caught a glimpse of the town surrounded by trees. We were also treated to a view of the desert below, including the White Sands National Monument. It’s pretty hazy down there, probably from the ever present wind blowing the sand around, but you can just make out the distinctive white line of sand. The next day after a leisurely morning filled with french toast and a few hours of reading and relaxing, we took the same trail, this time on our bikes, and headed into town. The ride from our door to main street through the woods is only about 2 miles. Love that! Downtown Cloudcroft is pretty small. 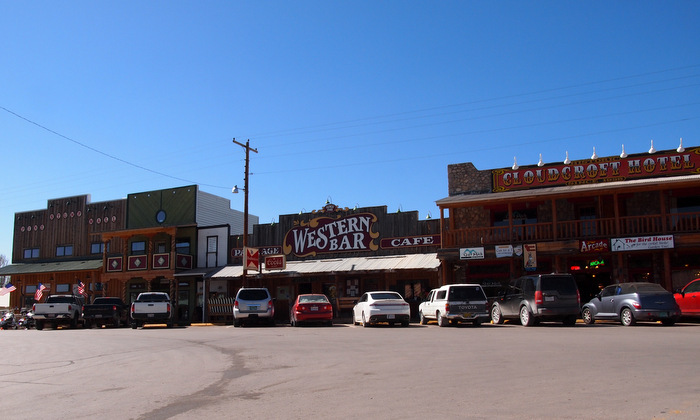 It consists of a single main street lined with western themed buildings. From town we rode across the main road and over to the Historic Railroad Trestle Recreation Area. 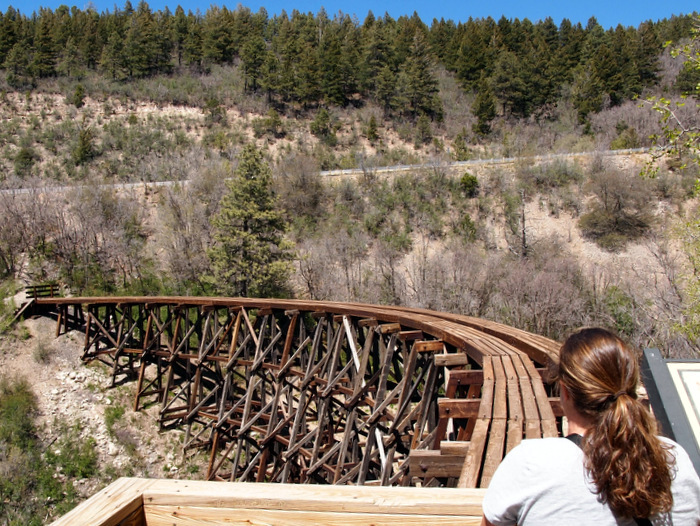 The Trestle Rec Area is a really cool network of trails that follow along some old rail beds and offer up a view of a restored wooden trestle that spans the Mexican Canyon. The history of the railroad is directly tied directly to the history of the town. The story goes that back in the 1890s the El Paso and Northeastern Railroad needed a steady supply of timber to continue building the rails north through Alamogordo. Lucky for them the Lincoln National forest was just to the east of the route and offered up a dense evergreen forest from which to gather timber. The survey team that scouted out the mountain summit found not only timber, but also a picturesque area with plenty of potential tourism appeal. So instead of simply gathering the timber, they built a 26-mile branch that curved up into the mountains. It’s destination was the new town of Cloudcroft- which means “Clearing in the Clouds.” The railway became known as the Cloud-Climbing Railroad, and at the time of its completion was the highest single gauge railroad in the world. The railway carried both freight and passengers and operated until the mid 1940s when the arrival of the highway caused rail traffic to diminish. Today only one of the 58 wooden bridges remain, but you can still see pieces of them at several points along the route. You can also hike and bike along some portions of the old rail bed which offer up the very same views passengers enjoyed over 70 years ago. That about does it for our weekend. Oh, except on Saturday night we ate dinner at Big Daddy’s Diner. We picked it because it got the best Yelp reviews of all the restaurants in town – which really isn’t saying much. 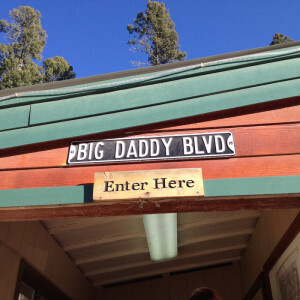 Well I am not sure if big daddy went on vacation and took all the spices with him or what, because it was the most boring, bland meal we’ve ever had. Tim got the pork roast, and it had no flavor what so ever. The coleslaw lacked all the normal zippiness that coleslaw is supposed to have, and even my salad was mostly iceburg lettuce served with a syrupy sweet raspberry vinaigrette. My Jack burger was okay. I was excited to see that it came with a slab of roasted green chili on top, but unlike the green chili burger we had in Hatch, this one was not even a tiny but spicy. Even the green chili was bland at this place! The strangest part was that judging by the amount of cars in the parking lot compared to every other restaurant in town, this was THE place to eat. Well if that’s the best the town has to offer, I guess we won’t be eating out again this week. Despite the dismal dining options, we really love it here and are excited to spend the rest of the week exploring the hiking trails, marveling at the trees, and breathing in the crisp mountain air. That’s a beautiful spot you have there! So nice to have a trail right out your front door! 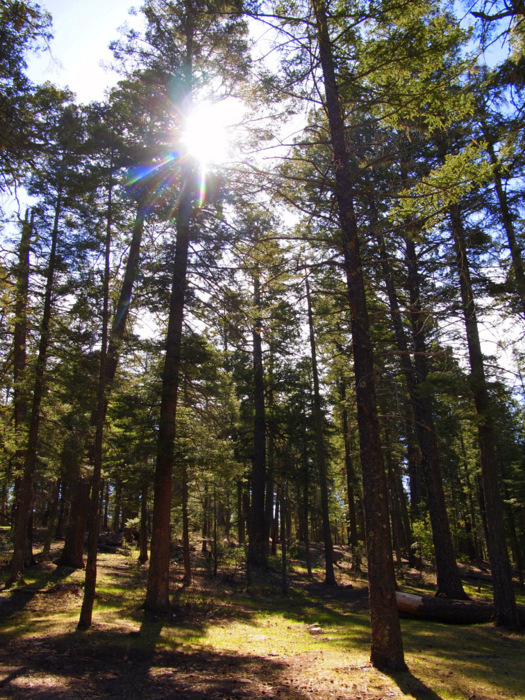 I feel the same way about the trees….one reason I am loving Sedona so much! Enjoy your time there Amanda! Nice post. We couldn’t get into Oliver Lee so we stayed at Boot Hill RV park across from the big pistachio. We took the alternate route to Brantley Lake State Park through Roswell as I was kind of worried about the grade to Cloudcroft. It would have been too cold at Cloudcroft anyway in late March. It’s interesting how quickly the seasons change – Brantley Lake was very cold and windy for the two nights we stayed. You’ll be blown away by Carlsbad – be sure to walk down rather than taking the elevator. I bet it would have been cold in Cloudcroft at the end of March, because just last week it was below freezing at night up here! There’s a little heat wave going on right now, so this part of NM is about 10 degrees hotter than average this week. We’re really looking forward to the cave!